I've been thinking a lot about the clothes I wear the most in my closet and thought it would be fun to culminate it in a wardrobe essentials post. 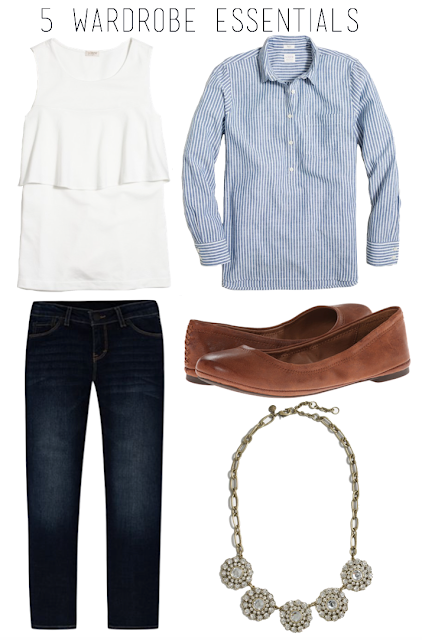 Dark wash jeans have always been a staple for me, they look great paired with any top and are so flattering. I always gravitate toward classic tops, such as stripes or fun white tanks. Tank tops can be so versatile, worn on their own or with a cardigan. Simply accessories are great, and a crystal necklace looks good with a button up or a bright colored top. And grown flats go with everything and are so so comfortable! As you can tell I have a very classic basis to my wardrobe, but I love to throw in more preppy and fun pieces. I would love to hear about your wardrobe essentials in the comments below.